4x4Pete had the most liked content! In my 6.0 I run full synthetic 5w30 and Napa/ Wix/ Mobil 1 filters. I've never had a problem caused by the oil or filter on any vehicle or engine I've owned. If you run a good quality recommended grade oil and change it at regular intervals your engine will last a very long time. More than likely some other issue will bring an end to it before using the recommended oil. If it makes you feel good about using another grade of oil so be it. I highly doubt you will notice an increase of engine life, there are too many other factors at play to determine that. 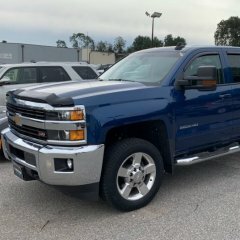 Leveled 15' 2500HD , what size tire can I go to? Yes. I got about an inch with that. The new tires do fill the wheelwells though. They are about 2.5" taller than the stock Michelins. I have been through some bouncy fields now and still no rubbing. 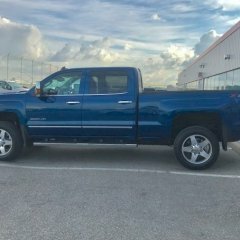 The OP sold his GM and went to Ford. Probably won't ever have any issues with that. Lol. Here are a couple more pics. Now I have about a thousand km on them. They are a a little louder than the stock Michelins. They are a 129 rating so the seem to ride a bit harsher than the stockers but they are aired up 70/60 psi to tow the travel trailer to storage. Haven't lowered the pressure yet but I think that will make a huge difference. I went with the Toyo's. Open Country Xtreme LT285 75r18. Certainly fills the wheel wells. Cranked tbars 4 turns prevoiusly. No rubbing anywhere. Made the truck just over an inch taller than the stock michelin's. I'm looking at this size too. Maybe Toyo AT 2 Extreme. They are supposed to be long wearing but that makes me think that they have a hard compound and will have poor traction before long. Anybody have good luck with these tires? I do little real off road just some fields and farmland. I have had the same thing happen to my truck. I just pressure washed the liner and left the cover off to let the weather and sun clean it out. Worked good. The spots are practically invisible, nobody but me sees them. I figure if you paint it the paint will come off partially and look worse than the rust. Try giving it a good clean if you're not happy with the results you have a clean surface to work with. Good luck. It may be possible that the f150 is cheaper to own over the first 5 years It's after that they kill you since they don't last to 10 years! Lol!! My '16 does the same thing when running empty. Usually between 2 and 3000 rpm going uphill or under slight load and maybe 4th gear and 40 to 50mph. If I run the same conditions with a 8000 lb 32' travel trailer behind the truck it runs smooth. I don't plow and only tow occasionally so I may not be a accurate judge on brakes for these trucks. I have 40k miles on my truck and the brakes have more than 1/2 left on the pads. The rotors are still smooth with no serious grooves . I service the brakes twice a year though. Maybe I'm wrong but I doubt that some gears and a tune would help with his mpg. 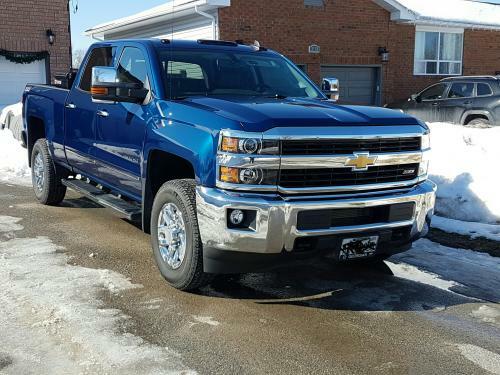 It will restore acceleration and result in better overall driveability but not increase mpg The truck is higher and the wheels are heavier so it will burn more gas to get it going and keep it at speed. You want to play you have to pay. What caused the feathering??? Tires don't feather by themselves. Check tie rods and steering linkage. I had a half ton feather some K02's as well. Dealer couldn't find play in the tie rods. I checked with a jack in the driveway and found it myself. Went to another dealer to replace under warranty. They wouldn't replace the tires though cause they were aftermarket. Very important to keep an eye out for this, it can destroy tires quickly. Have yoy tried it with a stock tune? I doubt it would make a difference but rule it out anyway.